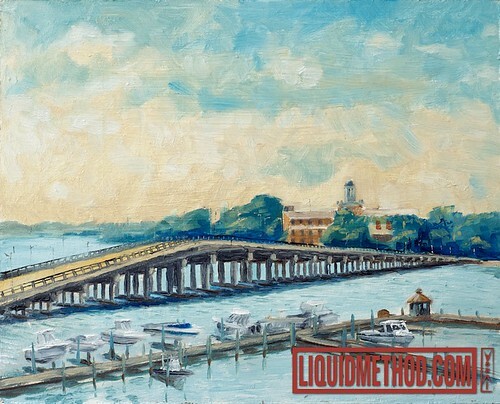 First of the Norfolk Yacht Club Plein Air Series, originally uploaded by Liquidmethod. For those that haven't understood my latest rantings on my blog, I have been participating in a group plein air painting competition. It's been at the Norfolk Yacht Club, the sale of the work is from 1-4pm this Sunday. If you feel inclined to show up and check it out, the address is 7001 Hampton Boulevard, Norfolk, VA 23505. Having participated in only one other event last fall, I thought I would take the opportunity to step up my game and learn to paint faster. This was my first attempt during the event. The bridge was challenging and I had to come back the next morning to finish, which meant sneaking back up stairs despite an event that was happening at noon. I finished the docks and snuck back out just in the nick of time. I've learned some things from this. 1. I don't paint fast enough. 2. I don't like painting boats, despite having spent most of my life around them. 3. Painting in the shade is almost a necessary evil. 4. Unlike most yacht clubs that I've been to growing up while sailing with my dad, these boats don't seem to see much action. 5. The Norfolk Harbor Police asked why I hadn't included their boat, until I politely pointed it out to them, (The small thingy docked by itself on one side). 6. People in general are fascinated that artists will plop down just about any where and paint, unless that's just me. 7. My mom always told me you can't say you don't like something till you've tried it at least once. She's right, but I still don't like painting boats. I also don't like jumping out of airplanes despite never actually have done so. 8. Framing your art is never fun. 9. Using your Jeep hatchback is great for shelter from sun and rain. 10. Never paint big. Unless you have hands of lightning and tons of paint to waste. 8x10 is great size, though 9x12 is a little more cinematic. That said, I have to say the staff at the Norfolk Yacht Club went out of their way to make the entire grounds available to use whenever possible, not to mention feed us too.